I love the holidays, but not necessarily having my birthday fall smack dab in the middle of them. But this year, I’d like to do something special for my readers. Over 25 authors and bloggers have come together to celebrate my 24th birthday (I won’t mention how many years I’ve turned 24 again). 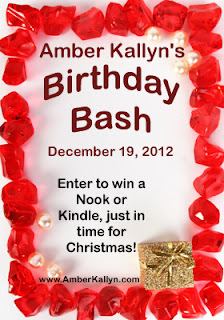 One commenter will win their choice of a NOOK Simple Touch™ with GlowLight or a Kindle Paperwhite (up to $140 value). Some of the other blogs taking part will have additional give-aways. The contest is open from Wednesday, December 19, to Saturday, December 22. Hop to all the blogs. The winner will be chosen from among those who comment on participating blogs. Leave a comment at each blog for additional entries to win. The winner will be drawn on Sunday, December 23. Happy birthday, Amber, and thanks for including my blog in your contest. Thanks for being part of the blog hop... Happy 24th again birthday . Very generous! Happy Birthday, Amber, and thanks for the opportunity to participate, Shauna! Cool. Lots of opportunities it looks like. Happy Birthday Amber. Have a great day. Happy Birthday Amber,thanks for the chance to win. Hope you have a wonderful birthday, Amber! Happy Holidays Everyone! Happy Birthday, Amber … Hope you have a have wonderful day.. Happy birthday, Amber--24 is a good age! Happy Birthday. Thanks for the hop! Wishing you miles of smiles in the coming years. Happy B-day Amber!!!! In honor of the day and fun hop I will leave a Christmas joke with each post/stop! It will spice things up a bit!! We had grandma for Christmas dinner? What a neat way to celebrate your birthday. Happy Birthday Amber!!! Happy B-day weekend, Amber! Enjoy your celebration! I hope you both have a wonderful holiday season. Thank you for the bash! Always a pleasure to celebrate with someone by hopping around to new websites. Thanks Amber for choosing this method to remember your birthday. Happy Birthday & Merry Christmas Amber!! Hope you had a wonderful birthday Amber!